“The Imposter” is Bart Layton’s fascinating documentary about the French imposter Frederic Bourdin. Here’s the bizarre story: One day, 13 year old Nicholas Barclay disappears from his home in San Antonio Texas. Three years later, in Linares in Spain, the young man turns up at a police station, having been, he claims, abducted by a gang of pedophiles. His sister, who has never travelled before, rushes to be reunited with her brother and to bring him home to the warm embrace of a worried family. But Nicholas Brady, now theoretically seventeen, is actually the twenty three year old Frederic Bourdin. Nicholas is a blue-eyed, blonde American. Frederic is a dark haired (he dyed it! 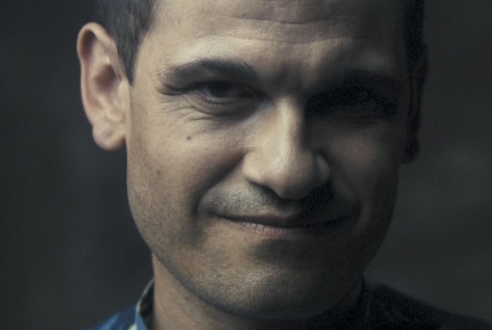 ), dark eyed man with no real resemblance and who speaks English with a heavy French accent. And as Bart Layton shows, he manages to pull off the con, seducing his entire family into believing that somehow the three years of abuse has changed him so much that the person they remembered is less real than the reality in front of them. Here’s a family that’s so – understandably – desperate for the return of their relative that they engage in a sort of willing suspension of disbelief. And only after five months – and due entirely to outsiders – does the story fall apart. Even then, as Bourdin languishes in jail, the story thickens. Bourdin accuses the family of killing Nicholas and using him as a handy cover for their murder. No body is ever found; Nicholas is returned in irons to France – where he was wanted by Interpol for multiple impersonations; and the mystery of how a family could be that deluded…or crafty… remains. Bart Layton pulls off the very clever feat of stitching together archival footage, interviews with the principal protagonists (Bourdin is chillingly unemotional as he recounts the details of his deception) and seamlessly ‘real’ reconstructions, to make for a documentary that has the arc of a marvelously well-told story. We’ve seen lots of stories presented using a documentary style to heighten the effect of reality (Christopher Guest’s movies for instance). Here’s actual reality presented with all the drama of fiction. A film about an imposter that’s itself a charming imposter of styles. “The Bourne Legacy” balances the need to reboot the franchise (the last Bourne movie was in 2007) as well as to continue the story. Tony Gilroy, who replaced Paul Greengrass as director, by and large pulls it off. And after all, who better than him – he has been the writer of the movies thus far. What he’s managed to do as well, is to deliver some chase sequences (albeit copies – or, to be generous, homages – of the previous films) that out-pump Greengrass’ hand-held excitement. He has learnt well from his former ‘boss’. The story – clever, clever – takes place at the same time as “The Bourne Ultimatum”. Then, you no doubt remember, Jason Bourne, ably abetted by Pamela Landy, had just managed to publicly expose the illegal and immoral program – Operation Blackbriar, a black on black op (how cool is the language of spy thrillers!) headed by the Machiavellian Noah Vosen (David Strathairn). The arc of the story is the need to contain the fallout from this exposure. It falls to Col Eric Byer (Edward Norton doing sinister), one of a number of shadowy figures to whom even the head of the CIA reports, to identify the strategy for this ‘containment’ . This is essentially that of killing off all of the persons (agent recruits and scientists) involved in what we learn, is an updated version of Blackbriar, Operation Outcome. Operation Outcome is essentially a scientific experiment aimed at creating a platoon of super human soldiers: fitter, with faster speeds of wound recovery (no wonder Jason could withstand all those car crashes. And there goes my theory that he learned his craft as a Nascar driver), more intelligent, and, to enhance their kill rate, reduced empathy. They’re also fed a diet of pills that make them drug dependent. We meet Aaron Cross (Jeremy Renner as one of the recruits) in a scene that takes us right back to the original “The Bourne Identity” : there’s a body floating, as if dead. The body shakes itself into life (just like the last scene of “The Bourne Ultimatum”) and swims into the story. Agent Cross, like all the Agents, has been targeted for termination, a fact that he soon figures out having narrowly managed to avoid drone attacks way up in some snow bound mountain training ground. His mission then becomes one of keeping alive – by avoiding the narrowing noose of Byer’s kill team – and finding his meds. It is this that leads him to Dr. Marta Shearing (the ever-radiant Rachael Weisz, or Mrs. James Bond), an unquestioning scientist in the program, who too is targeted for termination. She becomes the new Maria (Franka Ponente) of the franchise. They find their way to Manila, where the medicine is manufactured, and where she can help Aaron “viral off” his meds. (It seems to be terribly easy forging an American passport). There, in a roof-top scene similar to the one we saw in Tangier in “The Bourne Ultimatum” but even more excitingly shot and edited, they elude troops of government assasins. Just as Bourne ends “The Bourne Identity” in an idyllic spot somewhere in Greece, “The Bourne Legacy” ends in a Bond-like idyll, floating off to sea with his – now – adoring chick. Aaron Cross isn’t nearly as compelling and empathetic a character as Jason Bourne, whose existential search to find himself gave the character an interesting complexity. 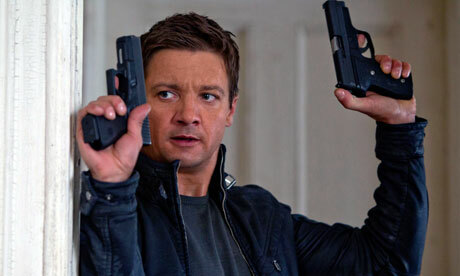 Renner’s Cross is, despite a few scenes of drug withdrawal sweats, all blunt action. The story is also long on exposition, though once the action fully kicks in, it’s unrelenting. Interestingly, the initial Bourne trilogy was underscored by the strong reassurance of a moral conscience; a sense that good will win. Jason was mainly driven by a profound need for retribution for his ‘sins’; Both Marie (Franka) and Pam Landy (Joan Allen) were seen as strong moral compasses to the dark amorality of Operations Blackbriar and Treadstone. Pam’s character suggested that the state would find in the end the means of doing the right thing. “The Bourne Legacy” is darker. The state essentially cannot find a way of doing the right thing. It doesn’t care. The lovely Rachael is basically an unquestioning amoral scientist working for an organization that, as the film concludes, may have failed in killing her and Aaron, but is winning the war of lies. Noah Vosen is re-emerging as a bastion of protection, Pam Landy is being accused of harboring a terrorist; even Aaron Cross doesn’t seem to have a moral compass. He’s all drug-fuelled energy. We eagerly await his return. And, sadly, as we all know, Rachael’s days are numbered.